The compendium consists of a square box with a hinged top cover. The accompanying pasteboard case is covered with tooled leather; it may be 16th century in date but seems too large to have been the compendium's original case. Around three of the sides of the main box is the signature: '[star] VLRICVS SCHNIEP HOC OPVS FECIT MONACHY [star] ANNO [star] 1563 [star]'. The outer face of the cover carries a nocturnal and volvelle similar to those on other Schniep instruments (Epact 33741). A band around the outer edges of the plate is marked in Latin for the four principal directions and encloses foliate engraving in each of the corners. The nocturnal is titled 'NOCTVRNALE HORAS NOCTIS PER STELAS VRSAE MAIOR: SOLISQVE GRAD: OSTENDENS' in a band surrounding the zodiac scale. Each sign in the scale is divided to 10 and 2, and numbered by 10, and is indicated both by its name and symbol. The south point of the scale is approximately 5? Virgo. The index pointer of the volvelle is marked 'A' and its edge is cut away amongst the daylight hours to reveal the zodiac scale. The hours run 3 to 12 to 9 with small tooth projections. There is no rotating rule against which a star would be sighted and any rule would have obscured the decoration of the subsidiary central volvelle. The volvelle also provides the length of day and night throughout the year for latitudes 44, 46, 48, 50, 52, 54?. An explanatory inscription begins 'INDEX A AD SOLIS LO: INTER DIV NOCTVQVE COLLOCETVR' and continues with either 'POLI ALTITVDO LONGITVDINEM DIEI MONSTERAT' or 'POLI ALTITVDO NOCTIS LONGITVDINEM OSTENDIT'. Two apertures reveal the six concentric scales of hours, in which each hour is divided to 1/2. After setting the volvelle against the zodiac scale, the values are read off against the fiducial edges of the latitude scales. Schniep gives the maximum and minimum values in hours and minutes at the solstices. The centre of the volvelle has a small silver subsidiary volvelle for converting equal and Italian hours. The silver volvelle is marked 'HORA ITALICE' with its hour scale 1 to 24. It is rotated against a scale of common hours 1 to 12, 1 to 12. The reverse of the cover has an inclining dial. The plate has a small circle of hours 3 to 12 to 9, with each hour divided to 1/2 and 1/4. The hour and half hour lines from 7 to 12 to 5 are extended to continue over a series of lines for solar declination, at 10? intervals. The 'TROPICVS CAPRICORNI', 'EQVINOCTIALIS' and 'TROPICVS CANCRI' are identified and the graduation is marked 'GRADVS SOLIS' at one side, and 'GRA: ZODIACI' at the other. The zodiac signs from Capricorn to Gemini are marked 'SIGNA CRESCENTE DIE', while Cancer to Sagittarius are 'SIGNA DECRESCENTE DIE'. The signs themselves are represented by their constellation images and, like the other decoration on the plate, have been acid-etched and then lightly engraved. The small folding gnomon (length only 16 mm) is sprung to the vertical and the shadow of its tip indicates the sun's position in the declination lines. The dial has an unusual means for its adjustment to latitude. Within the hour circle is a circular latitude scale marked 'ELEVATIO POLI', and graduated around part of its circumference for 40 to 57?, divided to 5 and 1, and numbered by 5. Rotating within this scale is a circular disc with pointer. As the pointer moves against the scale a small brass bar is projected or retracted from the hour plate. As it moves outwards (corresponding to increasing latitude) it makes contact with the side of the main box and increases the inclination of the dial plate. At a later date, the images of the signs from Cancer to Sagittarius were removed and a latitude scale engraved in their place. The scale of degrees runs from 10 to 64 and is divided to 10, 5 and 1, and numbered by 10. Symbols for the missing signs have also been added. 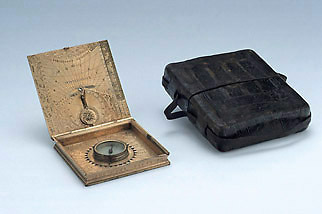 The scale is used in conjunction with a folding arm mounted on the main box and permitted the hour scale on the top cover to be used as a universal equinoctial dial, when a gnomon was inserted into the plate's central hole. In the main box there is a compass (bowl diameter 28 mm) which can be adjusted for magnetic variation. The silvered compass base plate has a single line which aligns with two opposed external pointers. The pointers move against two different scales: one of degrees 0 - 90, 0 to 90, divided to 10 and 2, and numbered by 10; the other is a scale of equal parts (but not degrees) 90 to 0 to 90, divided to 30 and 6, and numbered by 30. The origin of the latter scale, itself of uncertain purpose, aligns with the south point of a surrounding compass rose. The compass rose indicates 32 directions with alternating red and green enamelled triangular pointers (except that north, east and west are black, and in addition north is leaf-shaped). All the directions are marked in German and the four principal directions also have Latin tags ('SEPTE:', 'ORTVS', AVST:' and 'OCCAS:'). North by east is indicated by 'Nord ost' and is kept in lower case to distinguish it from north east ('NORD OST'). The same principle is used for the other similar directions. Around the compass rose in each of the four corners of the box there is engraved foliate decoration. The base of the compendium carries a three-columned 'TABVLA LATITVDINIS REGIONVM' of 69 places. The list extends beyond Europe to include places such as 'ALEXANDRA' and 'ANTIOCIA' and is compiled in approximately alphabetical sequence (though there is no discernible order among places with the same initial letter). For some reason, 'AVGVSTA', 'MONACHIVM' and 'SVTHGARDIA' are left until the end of the arrangement.